The Forerunner Supply Elevator is a building in Halo Wars. It is a structure that can be captured and controlled by the players. When it is controlled and an infantry unit is garrisoned inside, this building will perpetually create supplies for the player that controls it. It is a Forerunner structure that fulfills the function of a UNSC Supply Pad or the Covenant Warehouse. This can give the player a chance to replace the supply pad with something else, however if they then lose the structure they will be without a source of supplies, but because attacks on their base are much more frequent than that on the Supply Elevators, there is less of a danger of this happening. 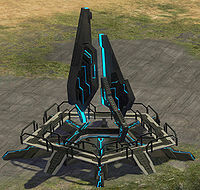 An early version of the supply elevator from the development Halo Wars. Renders of the supply elevator.